Dwight Bernard obtained his LLM in Law from the University of Leeds before taking the Bar Professional Training Course at the University of Law. After graduation and admission to the Bar of England and Wales as a Barrister-at-Law, The Honourable Society of Lincoln’s Inn in December 2009, Dwight went on to gain admission to the Bar of the Republic of Trinidad and Tobago in November 2012 and to the Bar of Grenada in April 2013. 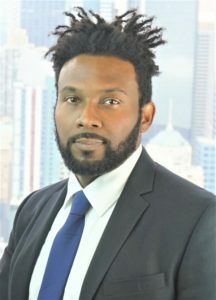 He maintained a general private practice based in Port of Spain, Trinidad catering to both Civil and a small cross-section of Criminal litigants, gaining experience as instructing and advocate counsel at the Magisterial, Industrial, Family, and High Court levels. Dwight’s academic and multi-jurisdictional professional training informs his professional conduct in adherence with the highest ethical standards. As a result, he is equipped with the ability to interact professionally, courteously, humanely and effectively with those facing any number and form of issues that require critical thinking, legal opinion and legal analysis in their resolution. He is excited to gain admission to the Bar and to put his unique perspective and experience to practical use in the Courts of New York.